HUMPTY DUMPTY famously cannot be “put back together” again. For those who care about the environment, every day since Donald Trump took office is a Humpty Dumpty day —with something being broken beyond repair. The federal government has started selling off parcels of the Bears Ears and Grand Staircase-Escalante National Monuments to anyone who hammers four poles into the ground and pays a $212 fee. The Trump administration has also slapped a 30 percent tariff on imported solar panels — making it more expensive for Americans to go solar and crippling the domestic solar panel installation industry. Additionally, the administration suspended the “Waters of the United States” rule, a key Obama-era regulation designed to reduce pollution in 60 percent of the nation’s lakes, rivers, and streams. The president’s 2019 spending plan would gut the Department of Interior, the Environmental Protection Agency, and especially NOAA — where his budget would force the agency to stop protecting coastal estuaries, Pacific salmon, and marine mammals. Conventional wisdom is that this president has a feeble grasp of the mechanics of government. But when it comes to the environment, nothing could be further from the truth. In his first 12 months, the president has mastered the full array of government rule-making, executive orders, budget cuts, and administrative and regulatory tools to launch a concerted roll-back of environmental protections. The driving force behind the administration’s push is a profound philosophical shift in favor of oil and gas exploration and commercial interests. In addition to the withdrawal from the Paris climate accord, Trump has repealed or frozen some 850 rules and regulations, many of which have a direct impact on the environment. Trump signed executive actions to revive the controversial Keystone XL and Dakota Access oil pipelines, both of which had been in limbo during the Obama administration. The Bureau of Land Management is selling off thousands of federally-owned parcels of land for oil and gas development. “Exploratory mining” is being permitted near national parks in zones where it was previously prohibited. And Trump has pledged to review the pollution and fuel-efficiency standards for cars and light trucks. Recent decisions by the administration pose an existential threat to dozens of fragile and endangered species, including the California condor, the Pacific salmon, the right whale, the polar bear, and the greater sage-grouse, an iconic bird that roams across the western plains. The threat to the oceans is arguably even worse. The Department of the Interior is proposing to open 90 percent of the outer continental shelf in the Pacific, Atlantic, and Arctic oceans for future oil and gas exploration. This completely reverses the current program, which keeps 94 percent of the outer continental shelf off limits. In the Gulf of Mexico alone, the Department of Interior is proposing to auction off oil and gas leases for 77 million acres on the coasts of Texas, Louisiana, Mississippi, Florida, and Alabama — the largest ever lease auction of its kind. 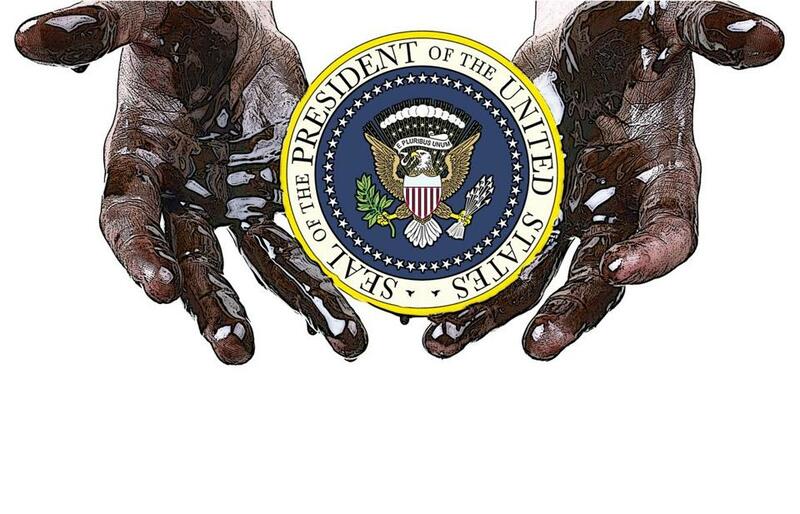 On top of this, the administration has weakened safety requirements that prevent oil spills. The Paris Agreement is a breakthrough in international climate change policy — it also falls short. The president is not just tilting in favor of the oil and gas industry — he is waging a full-throttle campaign to dismantle existing agreements on pollution, conservation, climate change, and biodiversity. The Interior Department recently reversed a key tenet of the 100-year-old Migratory Bird Treaty Act, which protects migratory birds from accidental dangers, such as power lines and wind turbines. The Department has also repealed protections for endangered fish and changed rules to allow private drones to be used in parks and forests — irrespective of the havoc caused to bird habitats. It is even reconsidering the status of national marine sanctuaries originally designated by George W. Bush and later expanded by Barack Obama to be the largest protected marine area in the world. These protected areas are home to sea turtles, dolphins, whales, sharks, giant clams, and untouched coral reefs, but Interior Secretary Ryan Zinke wants to shrink the sanctuaries to accommodate the needs of commercial fishing. Finally, there is the looming threat from Trump’s infrastructure plans. In his State of the Union speech, the president railed against the length of time required to secure road-building permits. Conservationists shuddered, knowing this was code for clamping down on environmental impact studies. Because the Republicans needed the vote of Republican Senator Lisa Murkowski (a longtime proponent of oil drilling in her state) to pass December’s tax cuts, the tax cut law also eased restrictions on oil and gas exploration in the Arctic National Wildlife Refuge. Last month, Zinke announced plans to build a 20-mile road in the Izembek National Wildlife Reserve — home to over 200 wildlife species, including brown bears, caribou, and virtually the entire global population of empire geese. The US Fish and Wildlife Service has rejected this project several times, due to the damage it would cause to the local ecosystem. This is just a taste of the kind of road-building that will happen if environmental assessments are no longer deemed important. Conservation groups are fighting back in the courts. They have filed thousands of lawsuits challenging the administration’s decisions. Although these actions may succeed in slowing or blocking some of the worst regulatory decisions, Trump is also moving rapidly to appoint conservative judges who are frequently unsympathetic to environmental concerns. Trump played an ace by appointing Neil Gorsuch — son of former EPA director Anne Gorsuch — to the Supreme Court. As EPA director under Ronald Reagan, Anne Gorsuch cut the EPA budget by 22 percent, reduced the number of cases filed against polluters, relaxed Clean Air Act regulations, and promoted the use of pesticides. Trump’s changes are like Humpty Dumpty because he is undoing decades of painstaking bipartisan negotiations under which federal agencies balanced scientific advice with the interests of states, localities, landowners, business, and conservationists. The president said he wants “to repeal bad regulations and use our natural resources to create jobs and wealth.” But his reckless disregard for the long-term damage to our environment should be a major issue for voters on both the right and left in the upcoming midterm elections. The challenge for Americans is how to even keep track of all this destruction over the next year. Two excellent sources are the Columbia Law School environmental tracker and a blog by former NOAA official Monica Medina. Complacency will lead to even worse outcomes. Linda J. Bilmes is a senior lecturer at the Harvard Kennedy School and a member of the US National Parks Advisory Board. She served as assistant secretary of US Department of Commerce from 1998 to 2001.